What makes Hawaii a "blue state"? Is it because Republican candidates simply get 'outvoted' by Hawaii's left-leaning voters who support the better Democrat candidate? Of course not. It's because the money that finances Hawaii elections goes overwhelmingly to Democrat candidates. It's not rocket science. The candidate who has more money has the advantage of speaking to his or her target audience as much as possible, as often as possible. Every two years, we see the same election returns and learn the same lesson: Money is the mother's milk of politics. Hawaii Democrats amass more money than Republican candidates. Otherwise, Republicans would certainly win more often. As every losing Republican candidate will profess, from the top of the ticket to the bottom: " If I had more money, I could have won." That's why HIRA continues to ask you to directly fund the good candidate of your choice. More funds gives them a chance to win. The Question: Where is the Democrat money coming from to clobber our Republican candidates? The Answer: There's a pair of related organizations that Democrats rely on year after year to directly finance the defeat of Hawaii's GOP candidates . . . practically EVERY ONE OF THEM. the International Union of Painters and Allied Trades. GROUP #1: Liberal website DAILY KOS describes the ideology of the Painters Union as a " progressive organization". 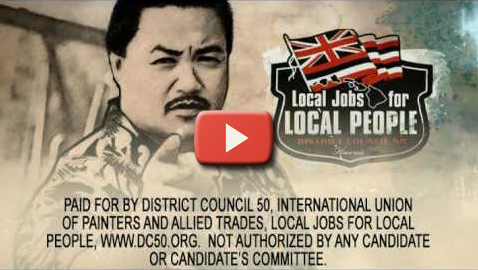 According to the Hawaii Campaign Spending Commission (CSC), the painters Union lavishes tens of thousands of dollars in campaign monies each election cycle on dozens of state and county Democrat candidates exclusively; such as Matt Lopresti, Willie Espero, David Ige, Neil Abercrombie, and Ernie Martin. They can't stand Republicans. Most recently in 2014, the Painters Union donated to Democrats . . .
GROUP #2: According to the Federal Election Commission (FEC), the anti-Republican International Union of Painters and Allied Trades backed Shan Tsutsui over Elwin Ahu last year and Neil Abercrombie over Duke Aiona. Also in 2014, the painters donated $5,000 to Mark Takai to beat Charles Djou. Two years earlier, the IUPAT spent $136,385 on an aggressive campaign of TV ads in 2012 opposing Republican Linda Lingle's bid for the U.S. Senate. How did Lingle get trounced by Mazie Hirono? Thank this Union of Painters. This union consistently backed Hirono over Lingle since the governor's race of 2002. With TV ads such as the ones below, the Union of Painters ensured that local voters came to believe Lingle was bad, bad, bad for Hawaii so that their puppet Mazie Hirono could spend the rest of her life in D.C. In 2008, they spent $5,000 on pro-rail advertising to shove rail down the throats of voters. Last month, they endorsed Hillary Clinton for president. Nationally and locally, they just don't like Republicans. These two anti-Republican groups hire the exact same lawyer that the Hawaii GOP hired and gave thousands of dollars to in order to go after conservative Republicans at HIRA. That's lawyer's name is Mike Lilly. WTF? Why pay a Democrat union lawyer with Republican donor money? The answer is clear. He was hired by the Democrats and RINO's at the Hawaii GOP to silence conservative Republicans at the Hawaii Republican Assembly (HIRA). 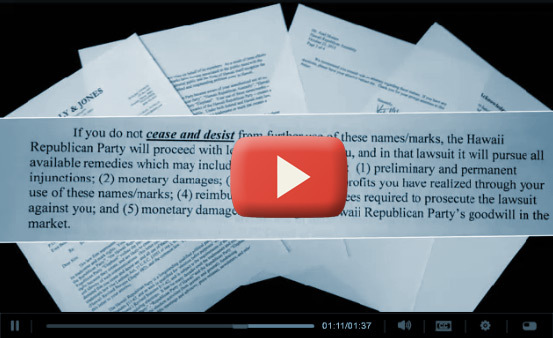 Yes, liberal party leaders at the Hawaii GOP are paying Democrat union lawyer Lilly to do the same work against HIRA that Lilly's union bosses do during election campaigns: Attack Republicans. Dig a little deeper and you'll find that, according to 'self-described republican' Lilly's own website, Lilly has proudly worked for these and other Democrat unions for "more than 20 years". These are the same groups which assassinate the candidacies of local Republican candidates year after year. Ladies and gentlemen, as you can see, this is fact. HIRA is simply reporting it. There are no implications or inferences. 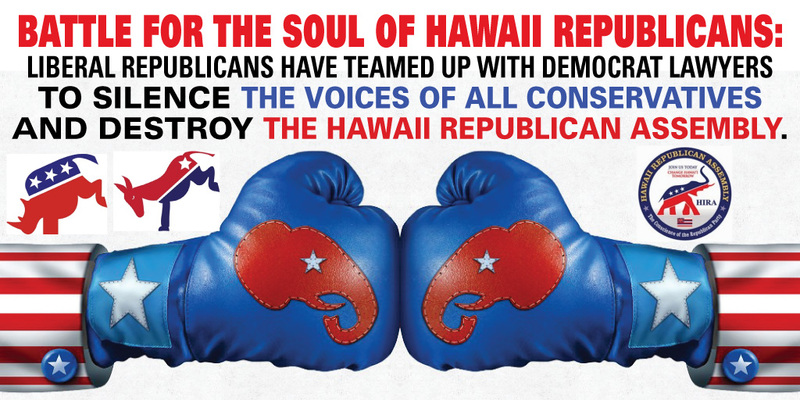 Since Mike Lilly's top clients specialize in destroying Republican candidates large and small, it could be powerfully argued that Big Monied Democrats have infiltrated the Hawaii GOP's inner circle of party leadership to help silence real Republicans and conservatives. With so many lawyers slithering across the Oahu landscape, including his own law firm, why is party chair and attorney Fritz Rohlfing diverting precious party funds to subsidize a guy who represents the Unions? You are the company you keep. Something is fishy when liberal party leaders and Democrat unions hire the same lawyer to silence Republicans. In 2016, political history may repeat itself in the islands with Democrats coming out on top. This time, it will happen with Republican donor money diverted by Hawaii GOP leaders to the Democrat unions' favorite courtroom hitman. NOW you know how Democrats finance their clobbering of Republicans . . . PRACTICALLY EVERY SINGLE ONE OF THEM. fix our party and to perform the work our party refuses to do: Educating voters about 60 years of failure by Democrats so we can get Republicans elected . Thanks for your generous support . . . and stay tuned for MORE shocking videos and breaking news next week.